There is no better example of a nation learning its political and military lessons the hard way than the process by which Switzerland adopted the policy of neutrality. Once rife with great warriors who eagerly fought and won many battles, its decision to live peacefully and not engage in any conflict was an approach it did not take lightly or easily. 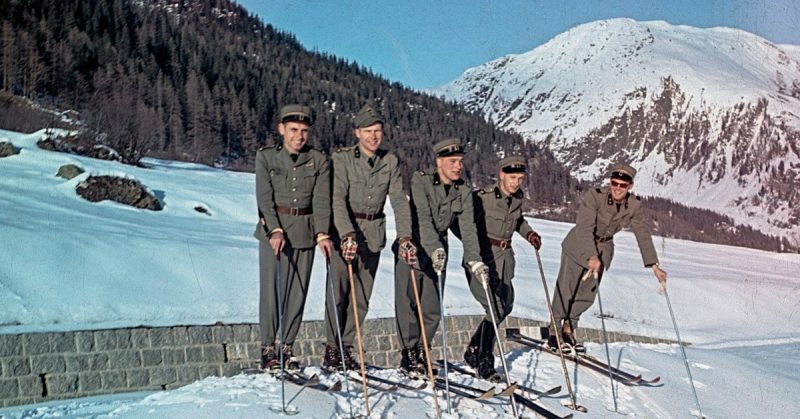 Swiss Army in the Alps during WWII. What many people are unaware of is why Switzerland has stayed so remarkably “calm,” if one can use such an adjective to describe a country. It has held to its policy of neutrality for 500 years, even during the worst of wars such as World War II, when choosing a side seemed the logical and moral thing to do. But for centuries, the country has said “no” to choosing sides, except for a brief period during the Napoleonic Wars. But even if that period is included, Switzerland has still been neutral for 200 years, and that is a remarkable achievement for any nation. The questions are: How? And why? The answer lies in the Battle of Marignano, at the end of the War of the Holy League, in which the Swiss endured eight years of struggle against the French. This battle ultimately cost both nations so much that they both swore they would never take arms up against one another again–and furthermore, they agreed to never ally with any country that wanted to go to war. Thus Switzerland is neutral, no matter the circumstances. 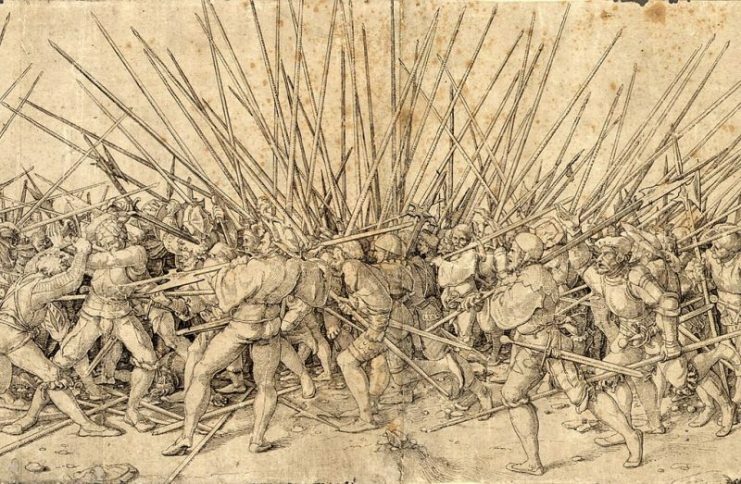 Swiss mercenaries and German Landsknechts fighting for glory, fame, and money at the battle of Marignan (1515). The bulk of the Renaissance armies was composed of mercenaries. 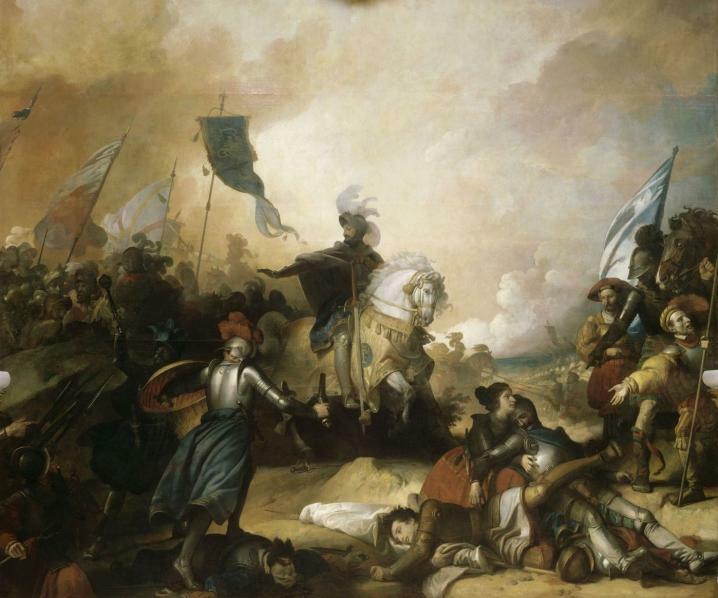 The War of the Holy League began in 1508, and lasted until 1516. The Swiss were fearless warriors, who were particularly skilled with pikes, long, narrow weapons that quickly and easily dispatched opposing soldiers. And they readily threw those down and picked up other arms if enemies got too close. 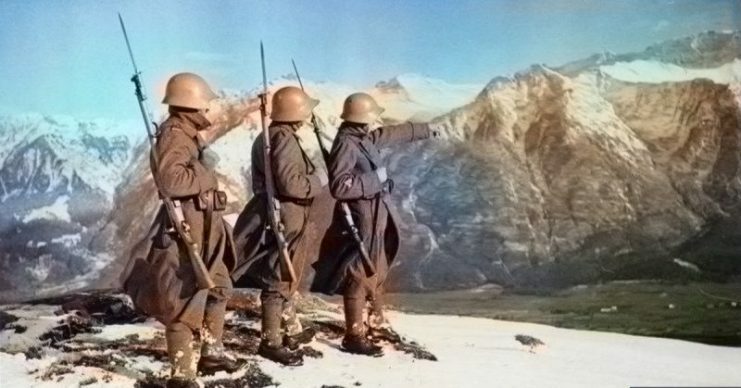 It was this kind of warfare that enabled them to seize a sizable portion of Northern Italy, which was an important access point for the French. 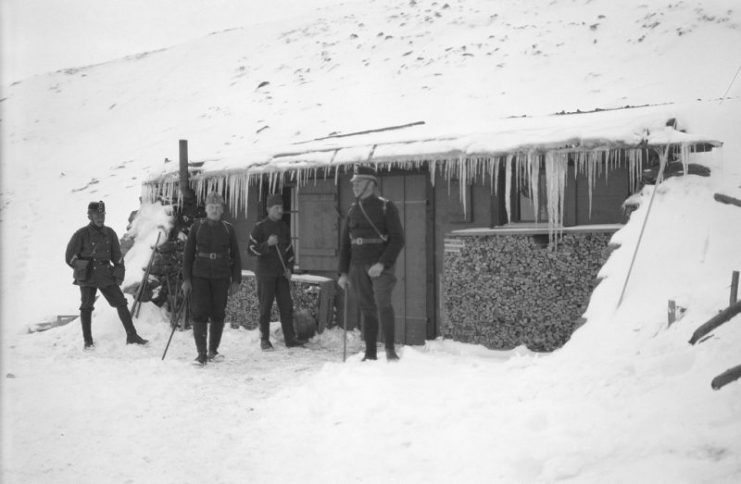 France’s King Francis did not take kindly to Switzerland’s move, and ordered his men to launch a surprise attack through the Alps, a previously unheard of military tactic. Francis at Marignan.A 19th-century painting from the Versailles Palace. After negotiations failed, the battle began. It was a horrific, costly encounter that taught the Swiss and the French some hard lessons. 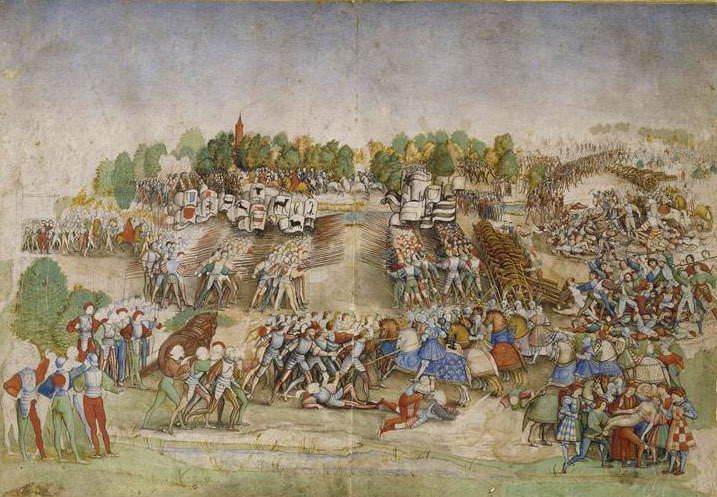 22,000 Swiss men took on 40,000 French soldiers, and because of King Francis’ clever maneuvering, the Swiss took heavy losses and the clash dragged on. Eventually, the French were able to subdue the Swiss invaders. Thousands on both sides died. The Swiss came close to victory, but in the end, it went to France. After a final, night-long struggle, both sides withdrew. The Swiss were amazing infantry troops, mostly fighting with pikes, but able to switch to other weapons when things got too close. They are depicted here in a fierce struggle with some Landsknecht. The battle is memorialized in many great artworks of both nations, a kind of living, cultural testament to the costs of war. Peace was declared immediately, and the treaty included what they called an “Eternal Clause,” which said they would neither go to war with each other again nor ally with each other’s enemies. 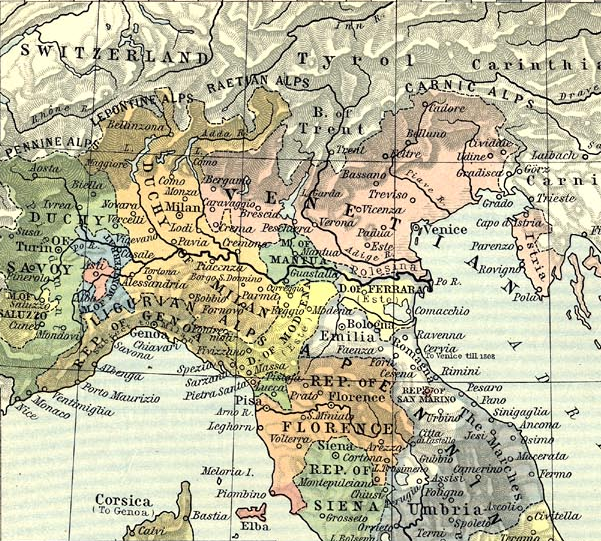 Northern Italy in 1494; by the start of the war in 1508, Louis XII had expelled the Sforza from the Duchy of Milan and added its territory to France. The pact has lasted until today. Although Switzerland has participated in peacekeeping missions, it has never broken its word–if anything, the commitment to neutrality is a source of national pride that grows stronger every decade, and the nation views it as a huge advantage in an unstable world.